Mark: "Hey guys! Look I found Newey's blueprints for next year. It's yours for a fiver and one of those awesome hats Fernando"
Massa: "That's no blueprints. That's Sebastian's coloring book!" MW: Look I found Seb's book of winning speeches. Lets make sure he doesn't get to use them this weekend. Alonso: Mmmmm, I like those thrrrrrreads. 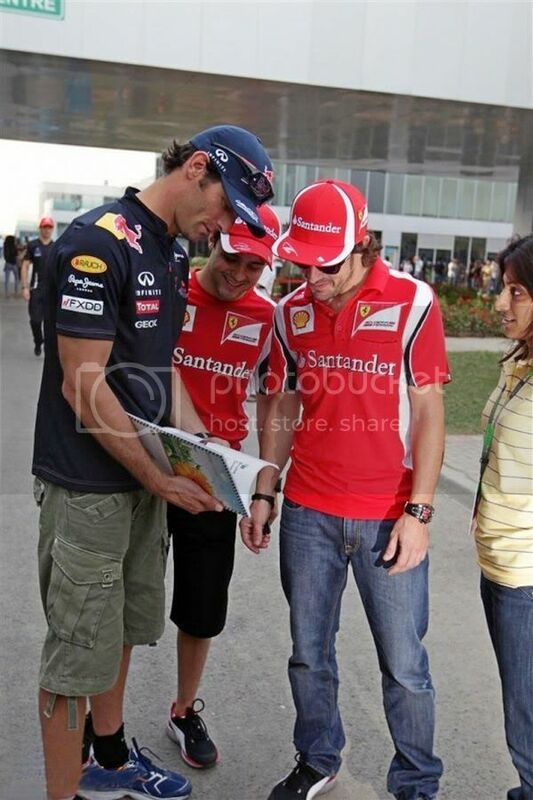 Left Webber: Guys, have u seen those webber-bombing threads on the internet, espacially at planetf1-forums. Middle Webber: Man, I'm eating - that's gross! Right Webber: AHHHH!! I HATE WHEN THEY DO THAT TO MY FACE!!! Girl: So, this is my thesis on CFD, with an interesting hypothesis on the effects of relative humidity on the coefficient of friction over the surface of a typical F1 car. Would you guys mind suggesting any glaring errors or opportunities for improvement in this? Mark: ...and now if we turn to page 14 you can see my dongle between the pages. Looks lads I found the parts manifesto. I told you I got all the stuff that fails Quality assurance testing. Guys, look at the pictures I took of the pit gals having a shower! Look at what I drew on Seb's homework! Right lads, I'll squeeze him at the first corner, that should get you past him Fernando, if anything happens to him in midfield then that will be a bonus. Then Felipe you come alongside on the straight & I'll pretend you are holding me high into turn 1 & that should get Fernando past both of us. Fernando and felipe, i now pronounce you man and wife! MASSA: Hey! What's the deal? I need some of those for Nando's car too. ALONSO: Shut up! Can't you see that Force India is spying on us?